At last! 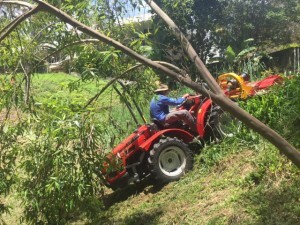 A Sunshine Coast based mowing service that does steep, over-grown and even dangerous terrain. We do the tough mowing jobs that others can't or won't do. Is your block rough and bumpy? This is not a problem. Our specialised machines are right at home in tough terrain. Is your block steep and dangerous? Our machines can go into hard to reach (and dangerous) ground. Steep blocks are our specialty with our custom machines made for the job. Is your block overgrown and becoming unmanageable? Please don’t worry, we can help you. We can have your property looking great in no time. We do the mowing jobs that others can't or won't do. We specialise in steep and dangerous and overgrown blocks. Don't risk serious injury (or even death) by attempting to mow this unsafe ground. Leave it to the experts. Our machines are specifically built to handle some of the roughest terrain and growth the Sunshine Coast can throw at us. And our team are fully trained and follow a stringent safety procedure to ensure ALL jobs are done correctly and safely. 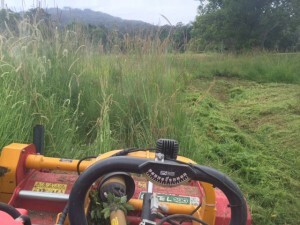 If you have a tricky mowing job then we'd love to talk to you. We're located on the Sunshine Coast and welcome the opportunity to quote on your job. A fast, reliable and punctual mowing service who can handle the tough stuff! Extreme Mowing offers a full and professional service. We're punctual and reliable and we won't stuff you around by sloppy service or running late. No answering service. We take all calls ourselves (business hours) and almost always answer right away. In the unlikely event we miss your call we’ll call you right back. 1 acre to 20+. We have the machines and people in place to look after your property. Our new machines typically cut down mowing time so you’re paying less, not more. We also have the regular type push mowers for small town blocks. Extreme Mowing as an extensive operating procedure. We don’t take risks and we ensure nobody gets hurt. If you’re on steep ground or have a tricky block we can help you. Our machines can cover most ground, leaving your block looking clean and tidy. We can even send a team of people in to ensure your job is done in rapid time.